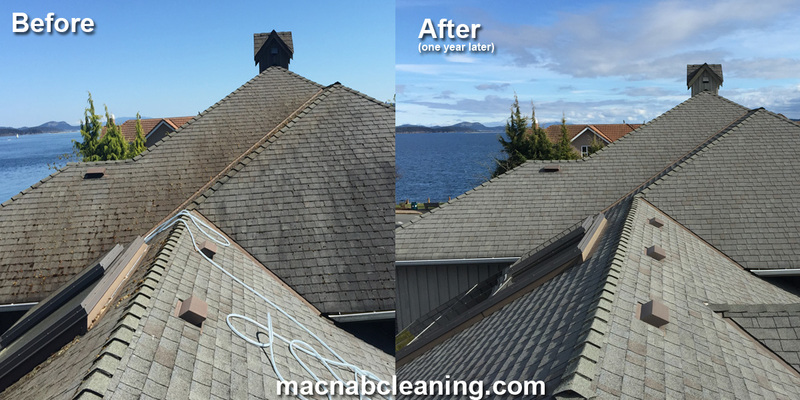 Covered in moss and black stains, this large 4 plex situated in Sidney is a great example of what a proper roof cleaning can do for your roof. A treatment with our moss control solution changes the PH of the moss, which kills the roots, enabling us to wash the infestations off with a low pressure rinse. This procedure is recommended by ARMA (Asphalt Roof Manufactures Association) and is by far a more effective way of removing and preventing these damaging infestations from coming back for years.